This stunning aerial photograph of the Very Large Telescope platform somehow reminds me of a smaller base in a real time strategy game, like Starcraft or Total Annihilation. However, this scene is perfectly peaceful. 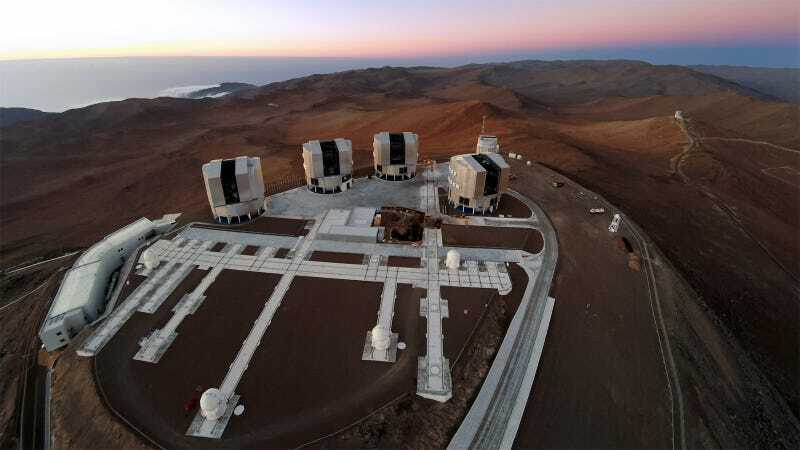 What you’re seeing are the four Unit Telescopes, the four Auxiliary Telescopes, and the VST, operated by the European Southern Observatory on Cerro Paranal in the Atacama Desert of northern Chile. In the foreground you can see the tracks along which the Auxiliary Telescopes — which look amazingly like anti-aircraft missile launchers — can be moved independently, forming an irregular grid-like pattern.